Episode #280 of the NLSC Podcast is out now! Dare I say it, this week’s episode is ON FIRE, as I had an opportunity to chat with the legendary voice of NBA Jam himself, Tim Kitzrow! It was a lot of fun talking to Tim, who was very generous with his time and stories. Be sure to follow Tim on Twitter, and hit up Who Said What Now to order your own custom audio messages from the Baron of Boomshakalaka! The voice of NBA Jam, Tim Kitzrow, joins the NLSC Podcast this week for an extended interview. Tim provides an insight into how he went from classically trained actor and improv artist with The Second City in Chicago, to being the voice of one of basketball gaming’s most iconic series. From the origins of the word Boomshakalaka and fascinating tidbits about NBA Jam and other games Tim has worked on, to Tim’s recent projects and a bunch of other fun stories, this week’s show is a must-listen for all NBA Jam enthusiasts! I hope you enjoyed my interview with Tim Kitzrow! Sound off with your thoughts on the NBA Jam series in the comments section below, or join in the discussion here in the Forum! Additionally, feel free to hit us up with any feedback on the episode, as well as suggestions for topics that you’d like to hear us discuss in future episodes. For more information on the NLSC Podcast including episode guides, check out this page in our Wiki. Episode #262 of the NLSC Podcast is out now! This week, I’m presenting my interview with Josh and Dave from Namo Gamo, in which we talk about their fantastic retro-oriented PC game, Basketball Classics! We also talk about the process and difficulty of video game design, some of our favourite NBA memories, and a lot more. It was a really fun interview, and I very much enjoyed getting some insight into an awesome game that already feels very polished, even in Early Access on Steam. We’ve discussed Basketball Classics in previous episodes of the NLSC Podcast, and will definitely have more coverage of the game moving forward. In the meantime, I’m sure you’ll enjoy my chat with Josh and Dave. During the 2018 NBA Awards show on TNT, Joel Embiid was officially revealed as the cover player for NBA Live 19. Embiid was considered a likely candidate after gamers noted that he was prominently featured in the reveal trailer that was released a couple of weeks ago. The official NBA Live website has posted an interview with Embiid, in which he discusses his journey to the NBA, the players who inspired him as a basketball player, and the challenges he’s faced since arriving in the league. An avid gamer, he also expresses his excitement at landing the cover of NBA Live 19. 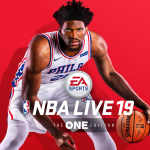 Notably, Joel Embiid is the first Philadelphia 76ers player to appear on the NBA Live cover. Glancing at the official website, he’s also been unveiled as a member of the NBA Live Squad on a promotional image that also features the silhouettes of four other players. 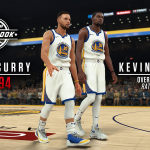 Much like Team 2K, the Squad is most likely a collection of players who have signed on as ambassadors for the brand, and will likely be featured in LIVE Events and other aspects of The One. Further details will no doubt be revealed when the rest of the Squad is unveiled. Embiid certainly seems like a solid choice for the cover of this year’s game from EA Sports. In addition to establishing himself as an All-Star in the NBA, the “Trust the Process” mantra that has been adopted by the rebuilding Philadelphia 76ers can also apply to the NBA Live series. It’s been a slow comeback for the once-dominant brand in basketball gaming, but from all accounts, it sounds like EA’s own version of The Process is finally starting to pay dividends. NBA Live 19 will be released on September 7th, 2018. A demo will be released on August 24th, and Xbox One users with an EA Access subscription can check out a trial of the full game on September 3rd. Check out the NBA Live 19 cover art below, and feel free to add your thoughts in the comments section. You can also join in the discussion taking place here in the NLSC Forum. With Durant’s overall rating of 96, it’ll be interesting to see if LeBron James equals or surpasses that mark in the default rosters. As noted by Yahoo! Sports, Fultz and Ball’s overall ratings are the highest for rookies since John Wall was an 81 Overall in the default rosters of NBA 2K11. Check out the screenshots below, or here in our NBA 2K18 gallery. Dave DuFour recently chatted to Chris “LD2K” Manning on his podcast, On the NBA. LD2K wasn’t at liberty to reveal too much at this time, but he did mention that defense is a priority in terms of gameplay improvements this year. He also noted MyPLAYER Archetypes will be receiving some attention. By referencing MyPARK, LD2K also squashed an odd rumour about MyPARK being cut, which seemed highly unlikely given that it’s the most popular online mode in NBA 2K. Daily Star also spoke to Erick Boenisch in the wake of last week’s developer blog on MyLEAGUE and MyGM. Erick reiterated the team’s commitment to the franchise experience, and notably described the MyGM story as a “light-hearted jaunt”. He mentions that the story will continue every few games, and doesn’t overwhelm gamers with narrative-based decisions. Check out the latest screenshots and interviews, and feel free to share your thoughts in the comments section below. 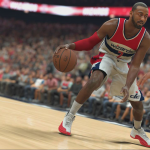 You can also join in the discussion taking place in our NBA 2K18 Forum. Operation Sports Visiting 2K; Send Them Questions! Our friends over at Operation Sports will be visiting 2K Sports next week, where they’ll have an opportunity to chat to former community members who are now working on NBA 2K. As such, they’re inviting the community to submit questions for them to ask. If there’s something you’d like Chris to ask, be sure to let him know here over on OS. Please note however, as clarified here by the one and only Leftos, this interview won’t be touching on any issues related to NBA 2K17, or providing any information about NBA 2K18. The conversation will be focusing on what it’s like to make the transition from a gaming community to the development team, what it’s like to work in the industry, and other developer stories. I’m also happy to pass along questions that get posted here at the NLSC, either in the comments below, or in this thread that I’ve set up in our Forum. Post them ASAP, and I’ll be sure to shoot them across to Chris.